Sri Krsnadasa Kaviraja Gosvami was born in a Nadiya family of physicians at the village of Jhamatpur, within the district of Barddhaman, near Naihati. “Lord Nityananda Prabhu had a servant named Sri Minaketana Ramadasa, who was a reservoir of love. At my house there was sankirtana day and night, and therefore he visited there, having been invited. Absorbed in emotional love, he sat in my courtyard, and all the Vaisnavas bowed down at his feet. In a joyful mood of love of God he sometimes climbed upon the shoulder of someone offering obeisances, and sometimes he struck others with his flute or mildly slapped them. “After saying this, he danced and sang to his heart’s content, but the brahmana did not become angry, for he was then serving Lord Krsna. At the end of the festival Minaketana Ramadasa went away, offering his blessings to everyone. At that time he had some controversy with my brother. My brother had firm faith in Lord Caitanya but only a dim glimmer of faith in Lord Nityananda. The lotus feet of the spiritual master of Sri Kaviraja are none other than those of Lord Nityananda Himself. 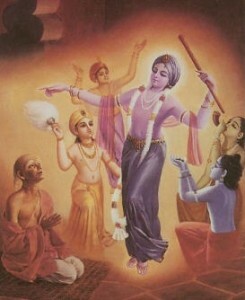 He accepted the Gosvamis Sri Rupa, Sri Sanatana, Sri Jiva, Sri Raghunatha, Sri Raghunatha Bhatta and Sri Gopala Bhatta as his instructing spiritual masters. From Sri Lokanatha Gosvami and Sri Raghunatha Bhatta Gosvami he begged permission to write Sri Caitanya Caritamrta, which would be the most prominent biographical work of Sri Caitanya Mahaprabhu because of its masterful weaving of Mahaprabhu’s pastimes and His teachings. Lokanatha directed Sri Kaviraja that he desired to be unmentioned in his book; that is why, in Sri Caitanya caritamrta, hardly a reference about Lokanatha Gosvami is to be found. 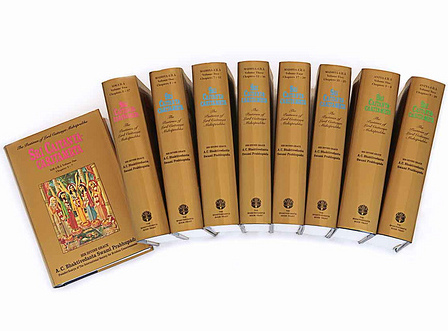 Sri Krsnadasa Kaviraja Gosvami compiled the following books which are still extant: Sri Govinda lilamrta, Krsna karnamrta commentary and of course, Sri Caitanya Caritamrta. Born:1496 (Christian) Diappearence: 12th day bright fortnight month of Asvin (the year is not known).